Streamline your business with 6 months free KashFlow Payroll, when you subscribe for 6 months. Don’t miss out, this offer ends at midnight on Wednesday 6th September 2017. Cloud based software means you can access and process your payroll 24/7 from anywhere on any device. Safety and security are top priority so you can focus on making your business a success. KashFlow Payroll includes everything you need for effective payroll in a small business. Pay monthly salaries and hourly wages from one place and easily update forms for employee, tax and insurance information. Automatically assess employees and enroll them in a qualifying scheme. 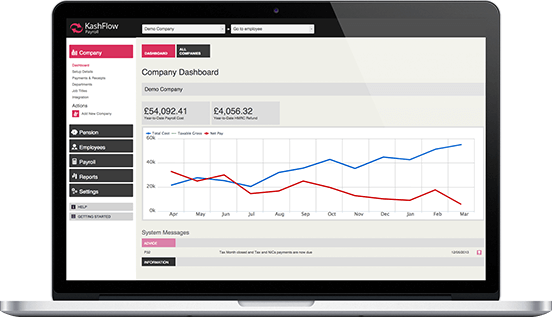 Calculate contributions, and automatically create the correct documents for employees and pensions providers. Our Payroll software calculates National Insurance, tax and more in your payroll run – saving you time. It includes the option to automatically send payslips to your employees as soon as they’re ready, and automatically send off your RTI submissions when you’re done.